I have to take a break from the Motley tales to wish everyone a Merry Christmas (while we are still allowed to say it). Hope everyone had a good one. Hopefully Santa was good to everyone. I have a little story from my Christmas that I though a few of you might enjoy. Yesterday after all the presents of round 1 were unwrapped and marveled over, my youngest son wanted to play with one of his gifts. From “drone strikes” to issues with drones and airports, the whole subject of drones seems to be bad. So the idea of giving one as a gift to my son took some discussion. Those of you with kids will understand, that any strikes against the gift were easily shot down by one important point that just could not be ignored… it was on his list. A “wish list” made by a young child for Christmas consist of many big gifts, the ones you know they really want, and only so many of them are actually doable, so when they are, you do them. Once the decision to buy him a drone for Christmas was made, (though as I just pointed out, that decision was actually made when he wrote it at the top of his “wish list” in big, capital letters) the only thing to decide was which one. There are lots of them. Most with cameras, though some of the smaller ones don’t have them. Most look like a sprinkler (lol, that’s for you long time readers). We talked about getting one of the smaller ones, not because they were cheaper, some under $40, but because it was his first drone and he is only 10. It might be good for him to start small. But they looked too much like those air hog helicopters, and he’d gotten his share of those last Christmas and on his birthday. Plus there were some really good deals on some really nice ones. So, we decided between 2 good ones. They were not top of the line, but they were nice. One had a lot of features like auto return, which seemed like a good feature, in hindsight it seems like a great feature. But the drone itself wasn’t as nice as the other one we were looking at possibly getting. It looked kinda cheap actually, so we went with the other one. The drone we bought was pretty sweet. Fairly good-sized, with a good camera on it, and cool lights that flashed underneath. It was this present that our son wanted to take outside and play with shortly after that first round of present debauchery. It was windy out, we had to get ready to head to grandmas for round 2, and the drone battery actually needed to be charged, but we took it out front and tried it out real quick, again any of you with kids understands. Luckily it didn’t crash into the house, but I told them everyone needed to read about the controls in the manual and understand them better before we take it out again. I also said we’ll have to take it to the park, so it doesn’t fly into someones back yard. Smart thinking, right? I thought so. After all, we all have seen the trouble that can bring. I set the drone up to charge and the family collected up the mornings booty and my wife and I tried to get the living room back in to some kind of living room order. Ripped boxes and torn wrapping paper put into trash bags and put on the side of the house. Stockings, toys, candy, games, books, gadgets, and clothes all taken to the rooms they now belonged in. Round 1 was over, but the many still unwrapped presents around the other wise livable living room, were there to remind us, round 2 was waiting. Those gifts (for the rest of the family that would soon gather at grandmas) needed to be packed into the trunk. Then we had to all get ready and drive over to grandma’s for dinner and round 2! “What?” I reply and ask at the same time. “The drone’s gone” she answered. A few minutes before this my son (the young one) had come into my room and told me the drone was done charging and he wanted to try it again. I told him no, because we were getting ready to leave, we would take it out tomorrow (today) and try it out. I told him I had read the manual and I will teach him how to use it, but for now to put it back in its box. Any one with kids knows it was my mistake not to put it back in the box myself. And as I already wrote, just a few minutes later my wife came into the room saying what she said. It turns out that my son took it to his older brother who thought it would be fine to fly it around one more time. So he took the transmitter (remote controller) and sent the drone into the sky. From what I’m told the drone flew straight up and the wind caught it a little and it went out of sight over the neighbor’s house. They ran after it, but it was gone. When I got out there they were knocking on neighbors doors and checking backyards. They checked every backyard around where they saw it go out of sight… nothing. Here we are the day after Christmas and it has still not turned up. And they looked everywhere. They keep hoping someone is going to find it and they will get it back. Of course, we know that isn’t how it works out sometimes. Someone may find it, think they were trying to spy on them and call the bomb squad. These things happen. The whole incident makes my imagination run a little bit and I start to wonder… what if it’s connected by some Twilight Zone reality glitch. My kids flew their Christmas drone up into the sky where it went through some kind of time barrier, worm hole in Las Vegas 2015 and came crashing down in Florida 2013, almost 3 years in the past, creating a time loop. These things happen. As I said in comments, I spoke with Murt on the Tweeter the other night. He has a new blog about him and I don’t think he likes it very much. 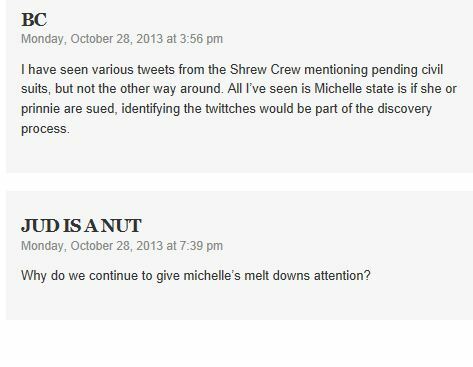 Since I have followed the whole Murt/Michelle/Radionewz saga, I have my own guess who’s behind the new blog. But for now I’m just observing. For those who haven’t yet seen just how much Murt’s story merges with LISK stuff and the liars and gamers involved there, let me refresh your memory. This may be hard to follow, but I have faith in my readers. I had a couple long talks on the phone with MM7, and we discussed this subject in the last one. MM7 does not see that making this Tweet is what brought Murt to the LISK table. 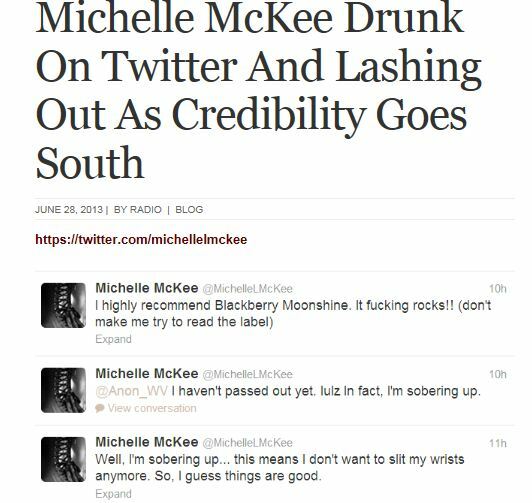 But anyone in the know about Murt knows he and Michelle McKee have been playing the old back-n-forth with each other for years. 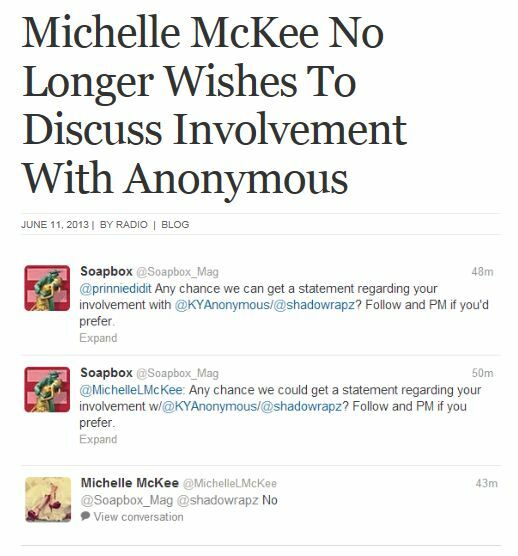 MM7 made an inquiery to Michelle, Michelle then got Murt involved in hopes of confusing the whole matter and screwing with Murt. Again, though, in my conversations with MM7, she dosen’t see it that way, or at least wouldn’t admit it happened that way. 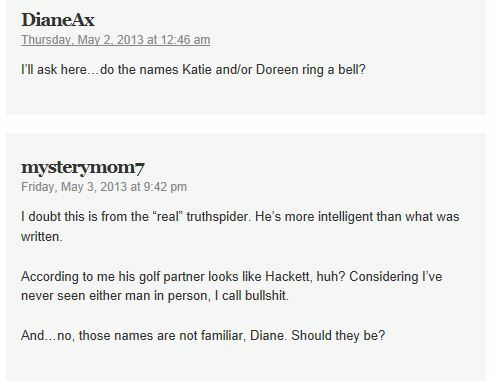 No, she insists that her telling Michelle about the “Drone” in a Tweet and then Murt coming to her (MM7) blog to give his 2 cents on the toy were not connected. 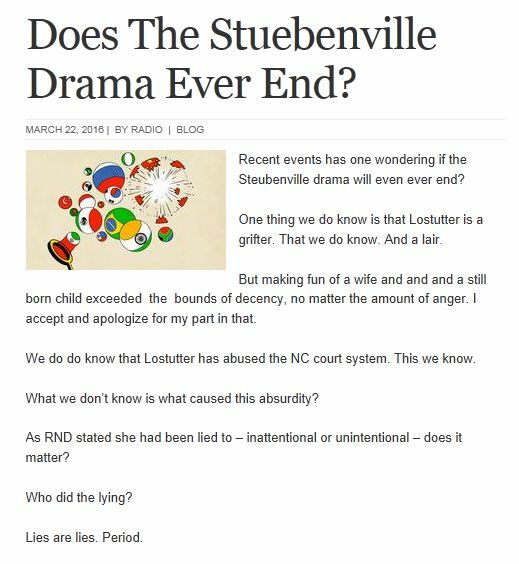 According to MM7, Murt came to her site on his own free will because he was connected to all this in some way. This is one of the many reasons I had a hard time trusting or believing MM7. Murt was not involved in this. 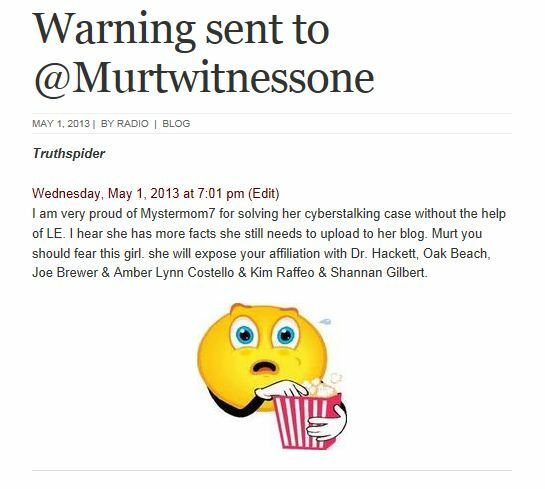 Say what you want about Murt, and people do, as I mentioned he has numerous blogs against him, and most who come to his aid, usually wash their hands of him at some point, but he was coaxed into the LISK stuff and called a stalker, but in this case it was all a set up. And for all I know they were all in on it. 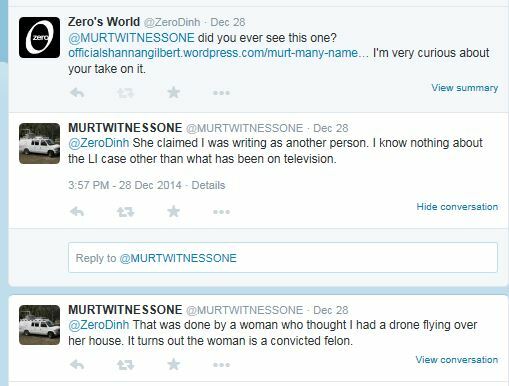 There was no Drone Stalker, MM7 has since admitted to me, that the toy probably belonged to a friend of her husband (or is it ex husband now, following Dorothy and Nancy’s footsteps there) who was living in their guest house at the time. Funny this was never mentioned anywhere at the time “Drone Gate” was going on. But even if Murt was duped into getting involved, he only has himself to blame. Because he is out there searching for the drama. He claims he doesn’t understand why so many “stalk and defame” him (sound familiar?) as he steps straight into each fire! 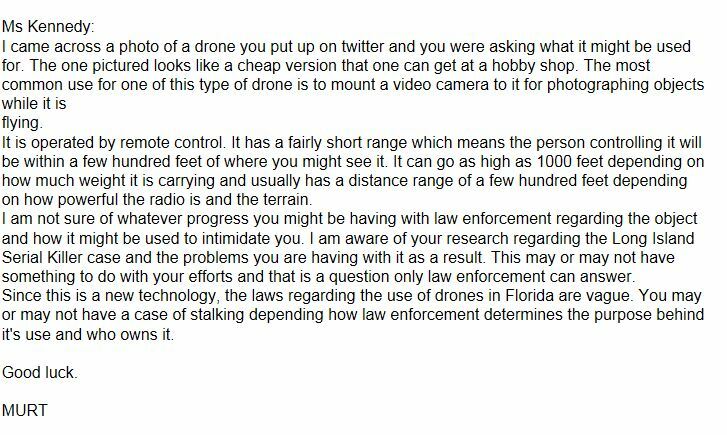 He should have seen the Drone mention for what it was… bait. And he might have and just didn’t care. 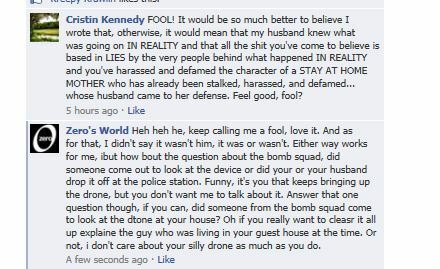 Either way, he contacted MM7 to tell her what he thought the “Drone” might be. 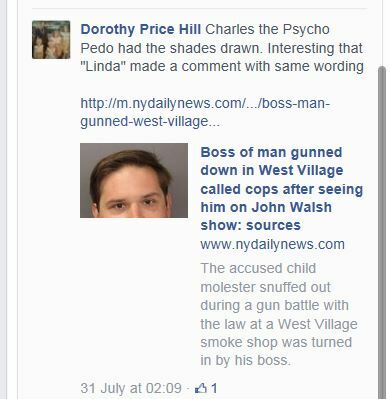 Which got him named as Cristin’s stalker. I can’t spend too much time explaining this, because this post is gonna be a long one and I’ve covered most of this before, so hopefully those of you paying attention get it… those who don’t, start all over read ALL the blogs involved… you’ll see what I see. 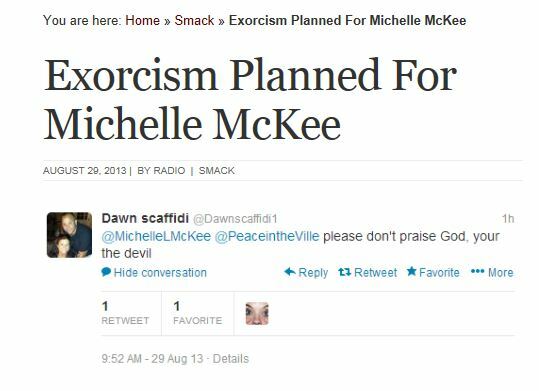 So this led to all sorts of worlds colliding and had me wondering, just how did MM7 know Michelle McKay. 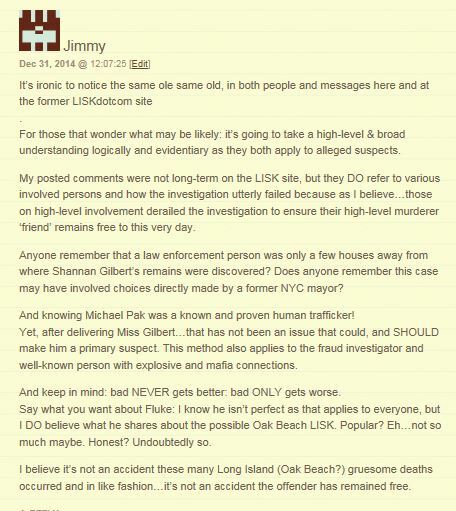 Now I’m learning most everyone involved here was on Websleuths at one time, that may be the connection… Websleuths has lots of cases profiled on the site and there was a cross over from Florida cases like the Haleigh Cummings case and the Casey Anthony case to the LISK case. Again, no time to get to into this, but if you read at ALL these places, and I have, you see the connections (yes, real connections Dorothy, not made up ones). I wrote about it as it actually happened, and pretty much called it all out as one big charade and it all went NOWHERE! Well it did go one place. For long time readers, you will remember that many thought this blog was done by MM7. 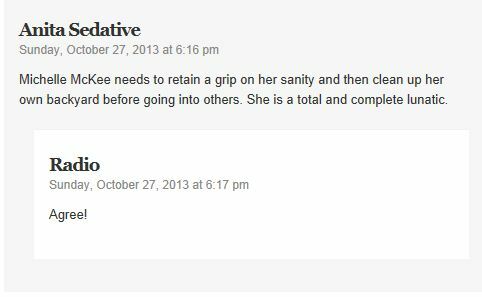 And because I mentioned this, all hell broke loose and in my opinion, back peddling started right up. Again all because my questions were just too much for those trying to keep up with all their lies. Now Mari Gilbert got involved at this point, and I am not gonna point any fingers or try to explain what really happened, but I’ll put it all out there, and as usual, you can decide. The blog had a poll on it for you to vote who you thought had killed Shannan, and some of us questioned those on that list. Mainly the inclusion of Fieldnotes, someone who once was friends with Mari and was part of that whole group who came to her and wanted to help. The whole poll seemed spiteful rather than helpful. So the blog is not ran by Cristin, but it was ran by a Kristine and then Mari took it over. At least that’s the explanation Mari gave. Cristin told me a much different story. She told me Mari was behind the blog from the get go, but didn’t want others to know it was her, so when the questions of who ran the blog came up, Mari said that she (Mari) just took it over from someone. Cristin also admited to helping Mari with the blog. 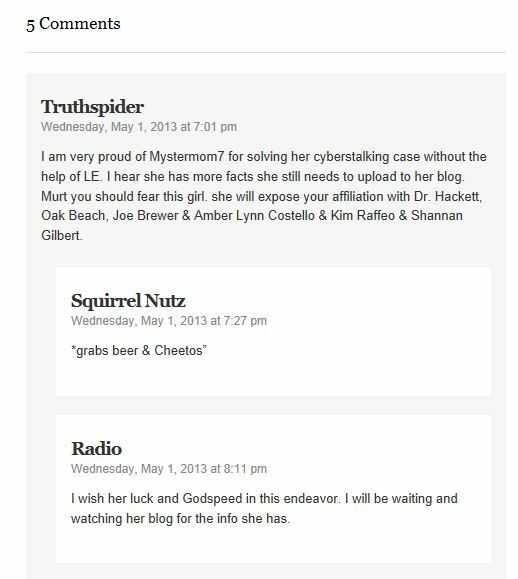 Yes, Murt believes Cristin is behind the blog… my point in bringing it all back up… people are confused here and they like it that way! They are all content with the game, they like the attention it brings. 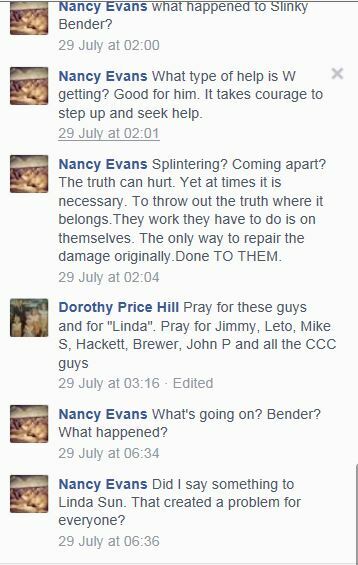 But as we have all seen, people are being hurt by all this confusion… anyone else keeping up on Nancy? 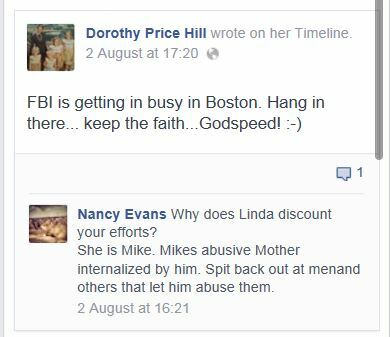 I really hope someone helps her soon, get’s her checked into a hospital and then go after Dorothy legally for her part in Nancy’s demise. My reasoning for believing Mari about not creating this blog (or at least given help on it) is mainly because the blog has stopped since Mari claims to have taken it over. I don’t think she planned the blog or knows how to continue it… this is my opinion based on what I have seen and read… as usual. Why do they all like the confusion they are caught up in? Why won’t they all see common sense? Everyone has their own reasons I’m sure, but mainly its to feed those chemicals in the brain. Some just can’t see the truth because it will cut them out of the game. You reading, Joey? I hope so. How ’bout you Jimmy? 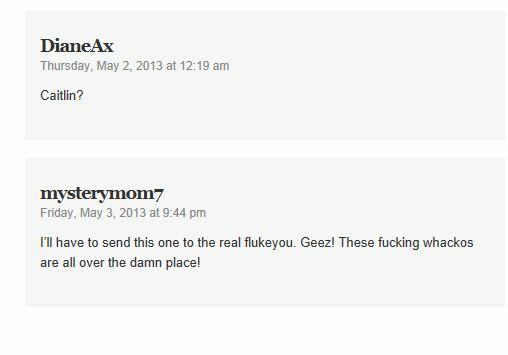 I already addressed these in comments (click “HERE” to read the comments), but I want to bring them up here, because I’m just amazed that anyone would still stick up for Fluke after all that has been shown. 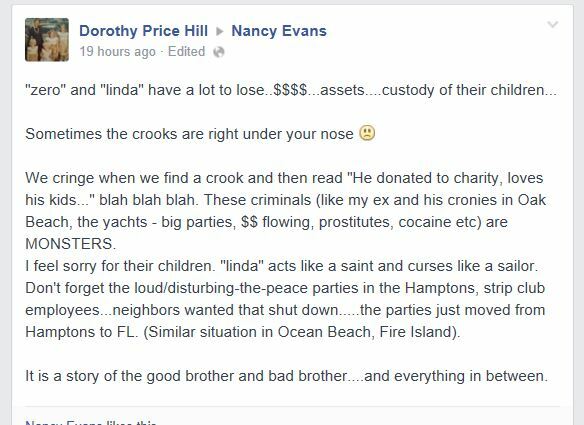 But hey Dorothy has lots of Facebook “Friends” and Bill W.’s followers would believe he walked on water if he said it was so, meanwhile you are all being played. Yes, even you Jimmy, who ever you are. If you for one minute think Joey/Flukeyou’s intentions are good or believe any of his crap he has lied about (most of his lies have already been shown for what they are, give it time and it will all be seen as lies, please come back and show me anything that Joey says or has said that ever comes to anything but a lie, there did I say the word LIE enough, those who have told them will be held accountable, at least here, and we all know I ain’t going nowhere) then you are a fool. Sorry Jimmy, I can’t put it any other way. Well that’s not true. You could also be a liar, (is pretender a better word?) just trying to get me going on Fluke again… Yea, I know that game. So… the beat goes on, and we all know, I’m always ready to dance.